​The sugar content of carbonated and still soft drinks varies considerably according to whether the product is to be supplied ready to drink, or as a concentrate (often referred to as a “syrup”). A typical formation would also contain flavouring or concentrated fruit juice, acidity regulators, preservatives, stabilisers, antioxidants and colouring. With “Diet,” and other “sugar-free” drinks the sugar content is replaced with artificial sweetners such as Aspartame (covered in a separate report). Small scale production of syrups with a low sugar content can be carried out at ambient temperature. However with some concentrated products, sugar solutions at 60% or above are not uncommon, requiring heating of the water to aid dissolving. In large scale operations, heating to around 35℃ (95℉) may be carried out to speed up dissolving. Other powdered ingredients may be dry premixed with part of the sugar, which helps to prevent them from agglomerating and "weights" light powders which tend to float. Liquid sugar can be considerably more expensive than granulated sugar. Dissolving of granulated sugar by simple agitation is a slow process. Conventional agitators cannot dissolve high concentrations of sugar at ambient temperatures. Heating the water to aid solution adds to costs and is energy inefficient. The cooling process further adds to costs and process times. 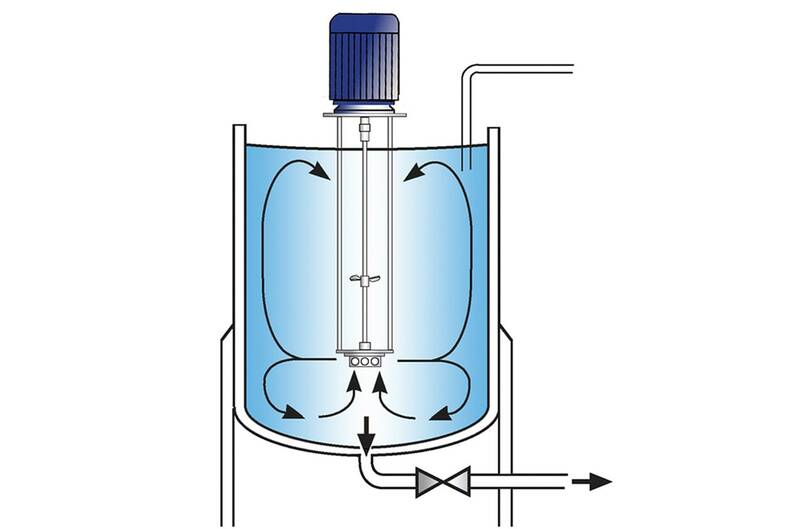 Incomplete solubilisation can lead to sedimentation or even blocking of vessel outlets. 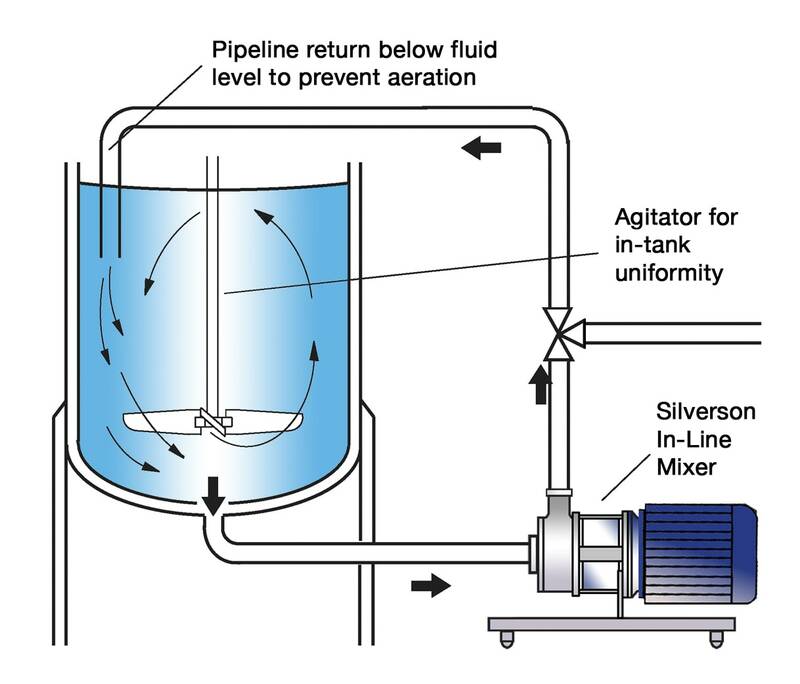 A Silverson High Shear Mixer can substantially reduce mixing times and eliminate the need for heating the water. 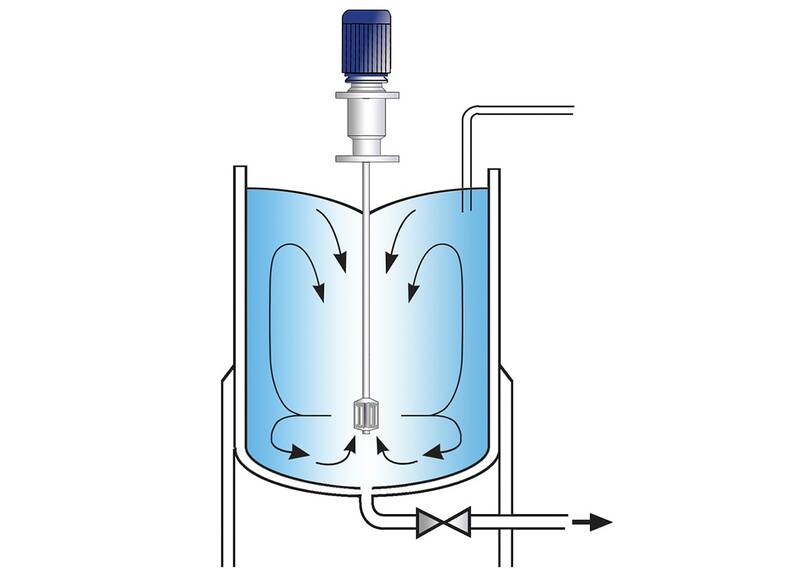 The high speed rotation of the rotor blades creates a powerful suction which draws the water and sugar granules from the vessel into the workhead. Centrifugal force drives the materials to the periphery of the workhead where they are subjected to a milling action in the gap between the rotor and the stator wall. The product is forced out through the stator as fresh materials enter the workhead. In a short mixing cycle all the material passes through the workhead, progressively reducing particle size and exposing an increasing surface area of sugar to the surrounding liquids, accelerating the dissolving process. The combination of granule size reduction and vigorous mixing dramatically reduces mixing times. A 66% sugar syrup can be produced at ambient temperature. Increased versatility allows the manufacturer to use sugar in granulated or syrup form. 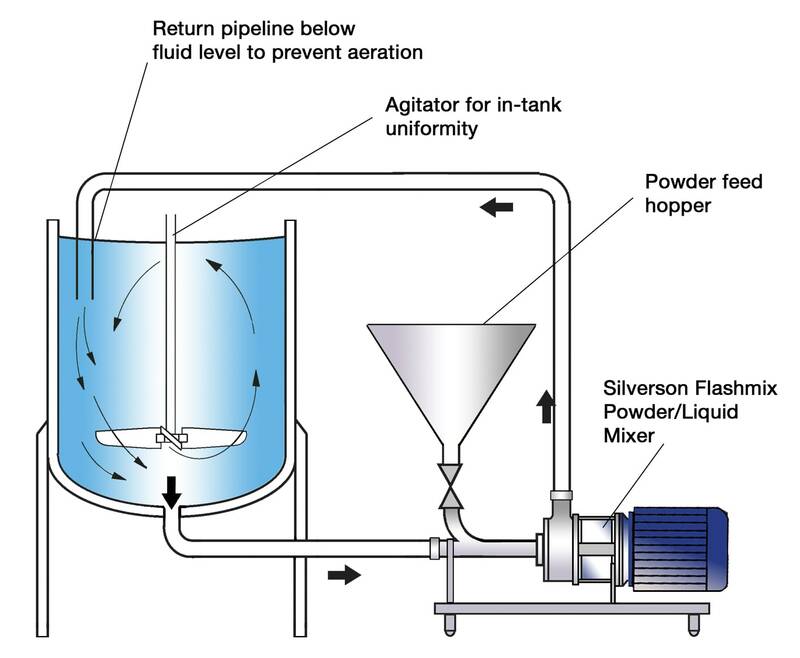 A Silverson mixer can also disperse and hydrate thickening and stabilising agents such as CMCs and Xanthan gum in a fraction of the time taken by other means. There are several products in the Silverson range suitable for this application, the selection of which is dictated by individual process requirements including batch size.